Several different North Clackamas School District administrators helped write a statement to apologize to the community for throwing away Milwaukie High School's trophies at the beginning of the Memorial Day weekend, in preparation for the razing and rebuilding of MHS's historic school building in June. "We didn't want one person to be the focal point for this mistake," said Jonathan Hutchison, district spokesman. "That said, Mark Pinder was insistent that his name be mentioned, as he's really apologetic for the error." Pinder has been the principal of MHS for 10 years and had planned to retire at the end of this school year; since Feb. 20 Carmen Gelman has been training with Pinder as a transitional principal to replace Pinder. In the statement Hutchison said was written by several administrators, NCSD "shares its regrets that some Milwaukie High School athletic memorabilia were mistakenly discarded but the items have now been recovered after some students discovered them and were assisted by a staff member." Students and staff dispute the notion put out by district officials that the trophies were saved from the trash bin. Several trophies broken beyond repair by Pinder's action to throw them in a dumpster are now in the possession of students. 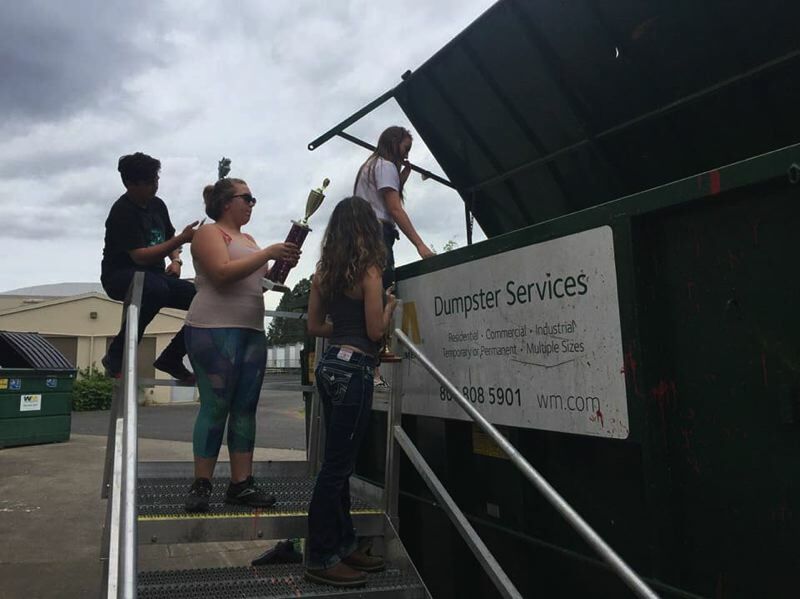 MHS sophomore Kayla Gilmore was staying after school in a classroom that happened to overlook the dumpsters on Friday, May 25, when she witnessed Pinder tossing trophies in the trash, assisted by the MHS athletic director. Her version of events has been verified with this newspaper by teachers at the school. When confronted by Gilmore and some teachers, Pinder told them to put all the trophies back in to the dumpster and that all these trophies were lesser trophies. A student pointed out that there were actually league, district and state trophies in there. Then Pinder walked away, witnesses said. Many trophies were broken in the act of throwing them into the trash, and Pinder eventually sent out a personal apology to the school after pressure mounted on social media. 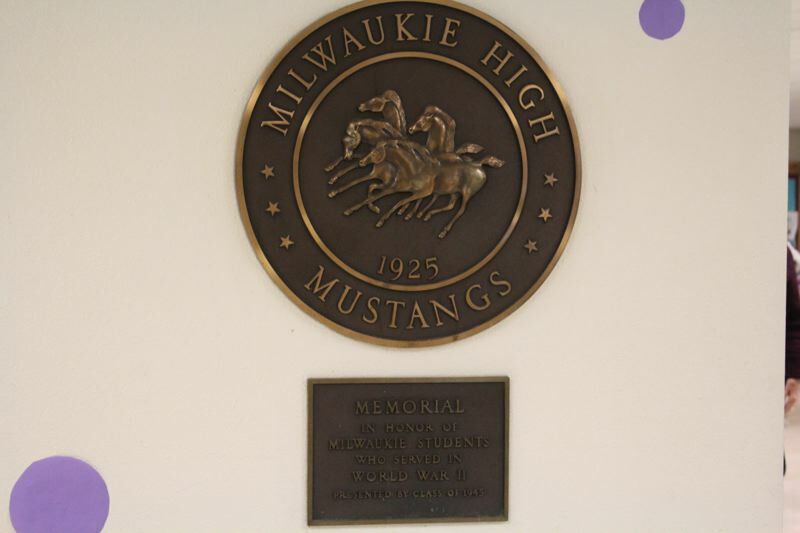 Gilmore said the apology was insuffient and wanted more assurance that other MHS treasures wouldn't be discarded, like the memorial for MHS students who served in World War II that includes her grandfather's name. "This was really a slap on the face," Gilmore said. One teacher who witnessed kids trying to pull the broken trophies out of the dumpster is also an MHS graduate and did not want to comment on the record for fear of retaliation by administration. Another MHS teacher, Head Wrestling Coach Brian Duhrkoop, a 1999 MHS grad, did not witness the event so was willing to comment generally. He was angered that Pinder tried to justify throwing away "lesser" trophies, which was not only untrue but also "how could anyone decipher which trophy is more important than another?" Duhrkoop asked. Duhrkoop's mother graduated from MHS in 1972, his grandmother graduated from MHS in 1949 and his uncle, a 1968 MHS grad, said he would like one of his trophies. 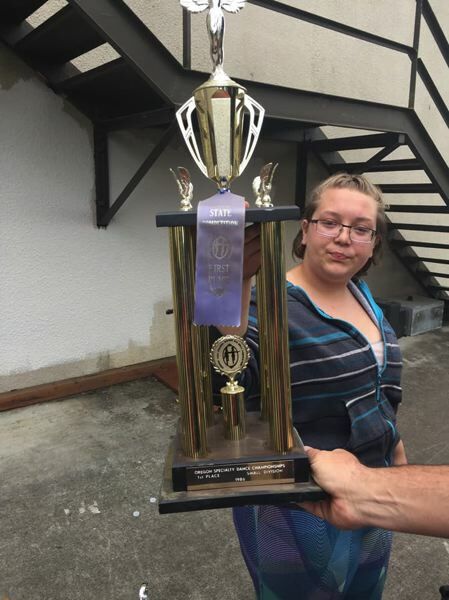 Gilmore said she had taken one of Duhrkoop's uncle's trophies home with her after she found it in the trash and promised to return it to Duhrkoop. Duhrkoop said he was glad that he keeps all of the MHS wrestling trophies in a locked room only he has access to, given the issues the school has had losing trophies over the years. Demolition of MHS's original main building is expected to b egin June 16 to allow for its reconstruction. In 2016 voters passed a $433 million capital construction bond; $77.2 million of that will be spent at MHS, which includes new MHS athletic fields. As a result of the impending demolition, staff have been asked to sort, pack and clean out items to prepare for vacating the building. 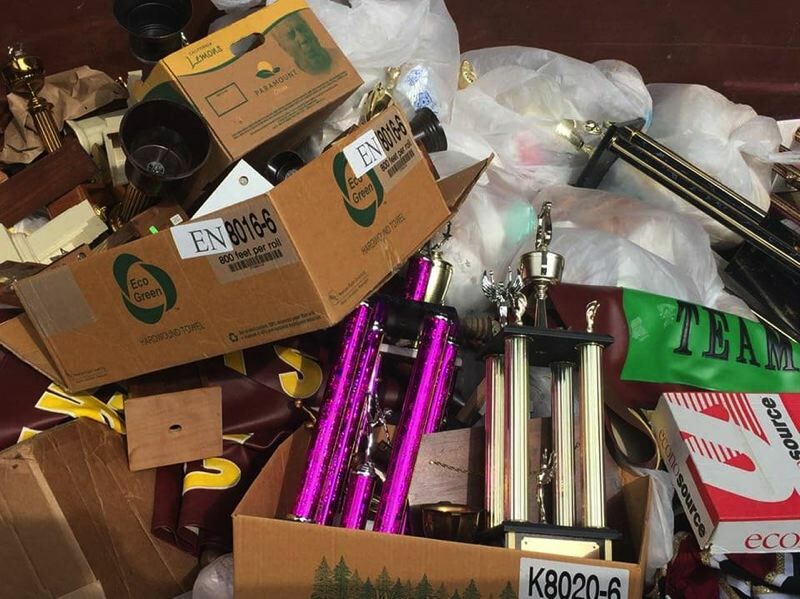 "During this cleanout, several boxes of trophies and other athletic items that have been stored for decades were found in an old portion of the campus," the NCSD statement continued. "While the intent was to only discard a few of the items that were broken and no longer readable due to damage over the years, additional items were mistakenly added to the boxes and sent to be discarded. There are still several boxes of items in storage that were not labeled for discarding in addition to the items that were recovered over the weekend. A trophy case located in the main building was recently dismantled and will be reassembled in the gymnasium building for display of many of the trophies." MHS alumni were incensed by the fact that any of the school's trophies ever ended up in a dumpster at the instruction of school officials. Tensions had already been running high with the district's decision to raze, rather than remodel, the beloved 90-year-old Art Deco MHS building in which John F. Kennedy campaigned for president. 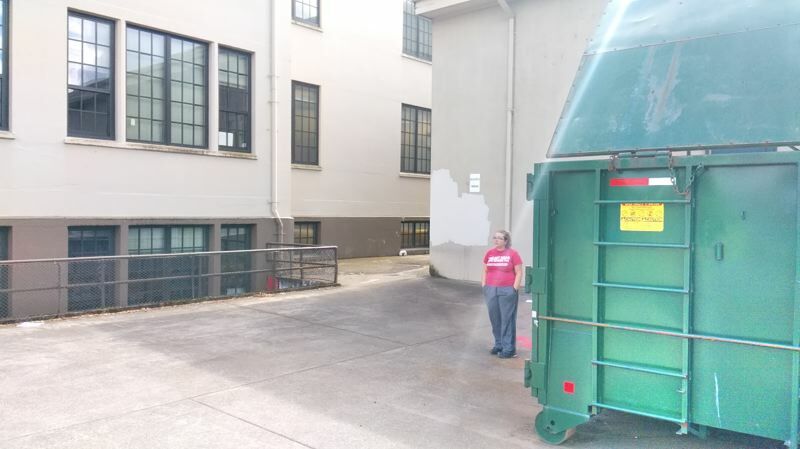 "In my opinion, discarding items which represent the long history of Milwaukie Union High School is absolutely unacceptable," said Suzanne Griffith Allen, a 1955 MHS graduate. "I am saddened by the apparent disregard for our Mustang history." "Milwaukie High Principal Mark Pinder is extremely sorry about the error and the angst this error has created among the community," the NCSD statement continued. "Principal Pinder is committed to working with staff and district administration to find a solution for securing the items during construction, along with storing them properly once construction is completed. There are several plans in motion with the architects to incorporate Milwaukie High School's long and rich history into the new building, and some of these trophies will be part of those plans. North Clackamas Schools recognizes the passion and loyalty the Milwaukie community has for their school, and the district aims to rebuild trust to maintain that loyalty."